Okay, if you didn’t know this, well you’re lucky you’re here with the Gadget Gang because as always we got you. Anyway, Samsung has got something really cool in store you might just be interested in. Yeah, a foldable Samsung smartphone. A first by this smartphone brand by the way. The foldable display concept has been touted for a quite a while now and Samsung has finally given the world an idea of what a smartphone with this kind of tech will look like. This they did at their annual Samsung Developer Conference. The foldable Samsung smartphone promises a small tablet screen size in a pocket-sized mobile device. When folded in two the device appearance resembles a thick-looking smartphone. But, at the conference where they unveiled the phone, Samsung didn’t allow developers or the media to touch and scrutinize the phone up close. Nevertheless, they still ensured everyone that mass production of the phone will be ready in a couple of months. Samsung is part of a small group of mobile developers that are working on foldable smartphones. Huawei has claimed to have a 5G phone with a screen that’s foldable in the works and are planning to launch it around the middle of 2019. However, Samsung and Huawei seemed to have already been beaten by a display-making startup from China called Royole. This brand already has one of their products on the markets as we write this. Royole says their phone will be available to the public later on in the year. 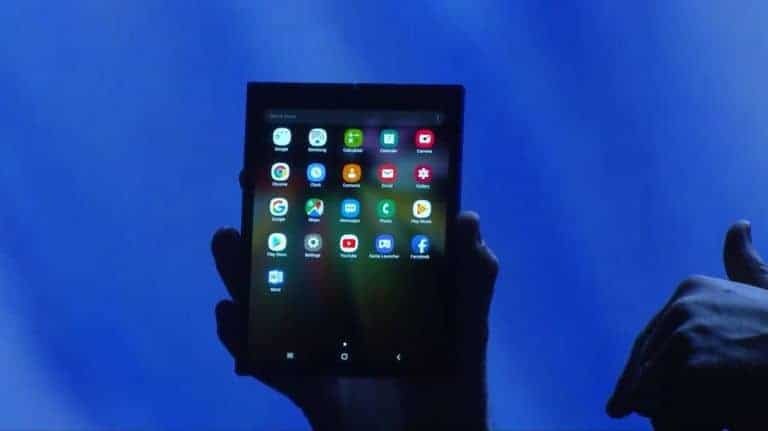 The senior VP of mobile marketing in Samsung, Justin Denison, was the one showing off the new smartphone at the conference, which when closed is a smartphone, but when opened fully it becomes a tablet. We can’t lie, the foldable Samsung looks amazing and might just prove successful. 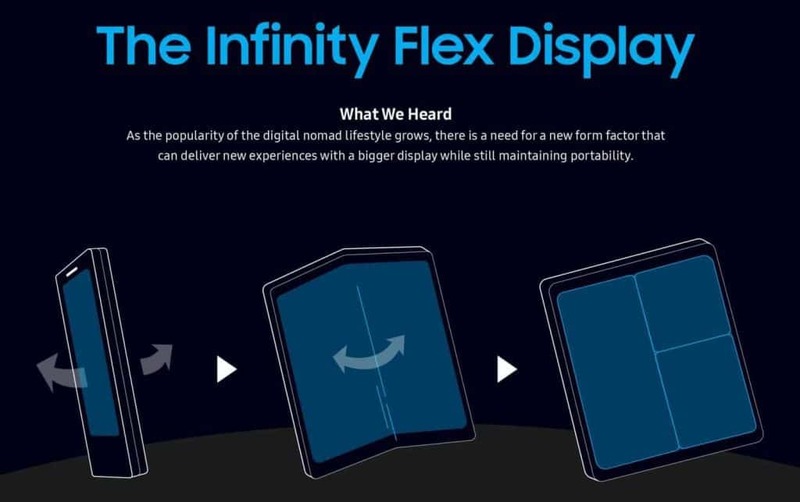 The new display tech it uses is known as the Infinity Flex Display. This new exciting technology allows you to close and open the phone over and over again without having to worry about degradation. Denison stated that the Infinity Flex represents a completely new mobile platform. He continued on and said that this new dimension they added was to help you multitask, watch and browse like never before. However, what he showed at the conference wasn’t the final product. The phone Samsung eventually release will likely have smaller bezels and be sleeker than what Denison showed to the world. 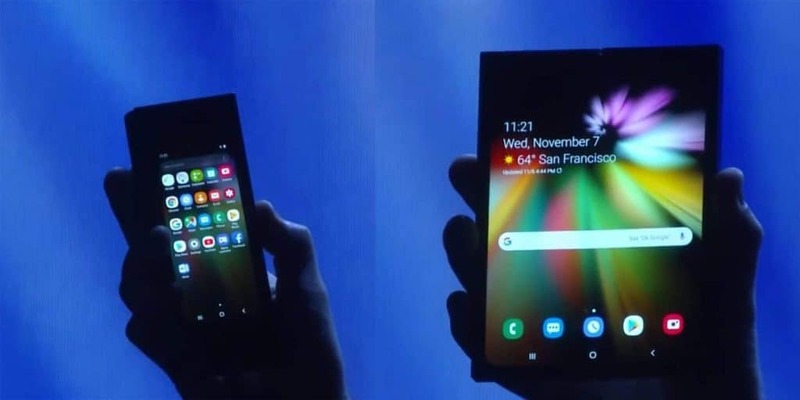 This foldable Samsung smartphone will be able to manage up to three applications simultaneously without struggling. This new display technology is specifically designed to unfold and fold repeatedly without having to suffer display quality degradation. Samsung claims you’ll be able to fold the phone several times over without you having to worry about wear and tear signs showing. At the conference, they wrapped the phone around a chunky outer-shell which they said they did to ensure their design remains a secret. However, for now, what we know is that, when folded out, the screen will measure about 7.3 inches. It was clear that the main thing Samsung was really interested in showing off was their display. However, they still also have several different applications in the works designed for flexible displays. These include stretchable ones as well as rollable displays. While those are not likely to make an appearance on the Samsung Galaxy X, their development will help them produce a more durable display build. There’s unfortunately not a lot we can say about the phone’s design because Samsung ensured they don’t reveal too much, beyond the screen display of course. The only thing we know for sure is that the phone will be operational even when fully folded. In fact, it will still have the characteristics of a typical smartphone even when in this mode. They also announced that they’ll be working closely with Google in the development of a new user interface designed for their Android phones. This product will be called OneUI. 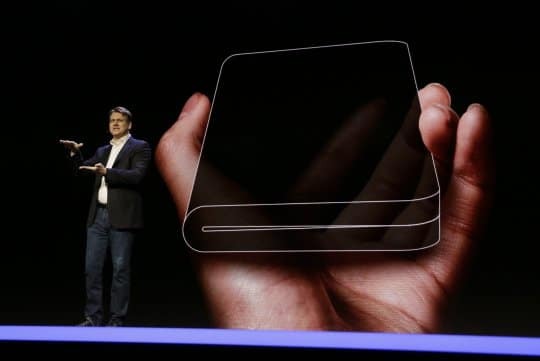 It’ll allow for features made specifically for foldable smartphones. Patents, as well as concept drawings, give away a few ideas of what the Samsung Galaxy X might possibly end up looking like. LetsGoDigital managed to get their hands on a Samsung patent and from the images on the patent the display looks like it’ll be hidden under the mobile device’s top rear when unfolded. When it’s closed is when it comes out. While this is still largely just a rumor it may be how the hidden screen display will function. Rumours suggest that consumers should expect the Galaxy X sometime this year, however, we think it’s most likely going to be out to the public in 2019. At the conference they said it’ll be out in the “coming months” so for now really all we can do is wait and see. All the same, here at the Gadget Gang we’re excited at this new prospect. Hopefully, now you will too. Previous articleSony Xperia XZ3: Has Sony finally got things right? Edge Computing: Is this the Future?